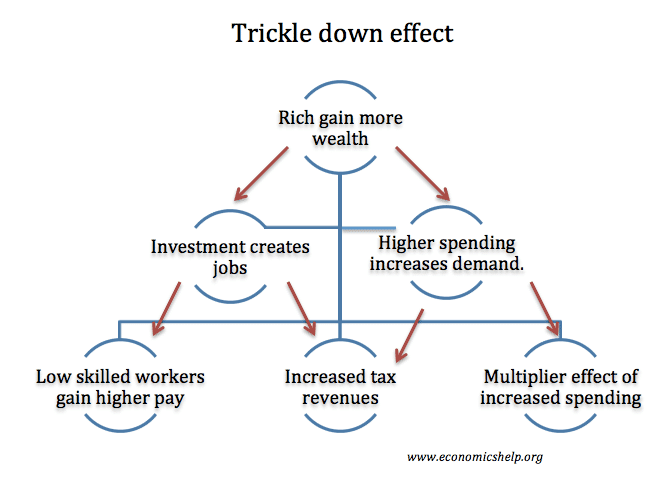 Trickle down economics is a term used to describe the belief that if high-income earners gain an increase in salary, then everyone in the economy will benefit as their increased income and wealth filter through to all sections in society. They will spend a proportion of this extra wealth. The extra wealth will cause an increased demand for goods and services, causing higher employment and rise in wages. The higher wages will also cause a multiplier effect, e.g. if more chauffeurs are employed by the rich, the chauffeur will gain increased income and, in turn, they will increase spending in local businesses. Alternatively, the wealthy may invest their increased wealth. If the wealth is invested in new businesses, it will create new jobs and increase incomes of those employed. Higher spending and investment will stimulate economic activity leading to a rise in tax revenues (higher income tax, higher VAT). Higher tax revenues can fund public programmes such as healthcare, education and welfare payments to the poor. 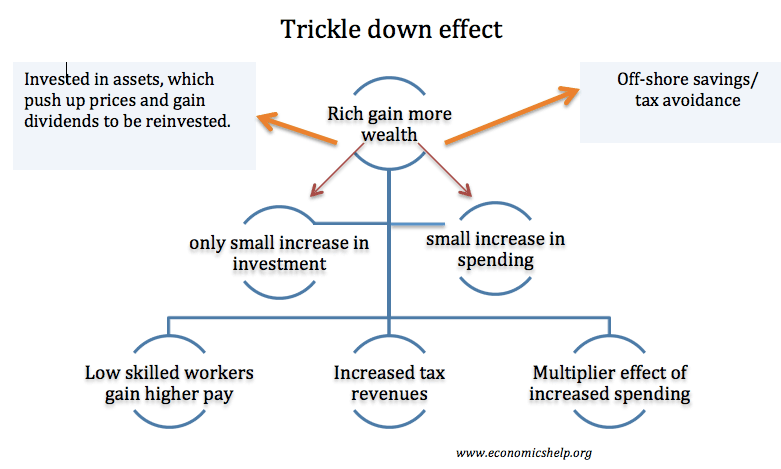 However, others criticise this belief in ‘the trickle-down effect. In particular, the wealthy have a higher marginal propensity to save. In recent years, wealth has been saved in off-shore accounts to avoid paying tax. Also, some studies suggest that increased income inequality can lead to this inequality being solidified through educational opportunities, wealth accumulation and the growth of monopoly/monopsony power. Furthermore, increased inequality may lead to lower rates of economic growth. A recent report by the OECD found that since the start of the credit crisis in 2008, inequality has widened in many countries; however, this inequality has led to lower rates of economic growth not higher. 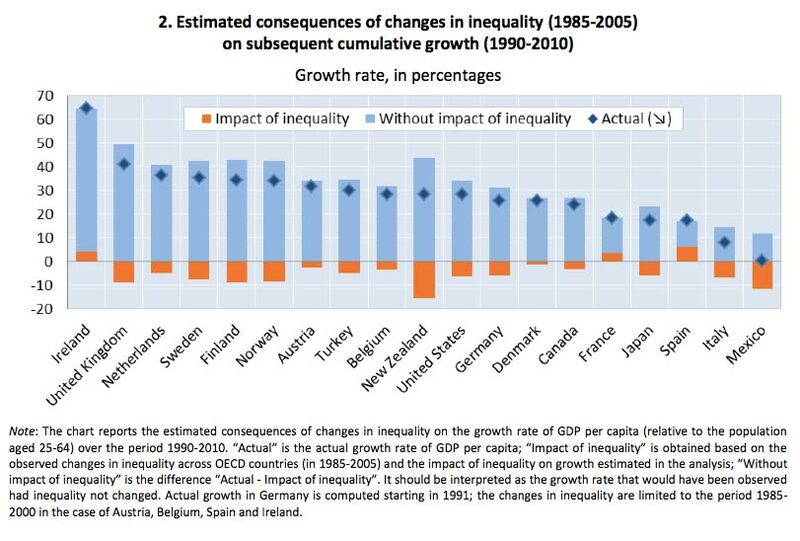 This graph from an OECD report suggests that inequality is responsible for lower GDP. The OECD estimates that the UK economy would have been more than 20% bigger had the gap between rich and poor not widened since the 1980s. If high-income earners see an increase in disposable income, they will increase their spending and this creates additional demand in the economy. This higher level of aggregate demand creates jobs and higher wages for all workers. Alternatively, increased profits for firms may be reinvested into expanding output. This again leads to higher growth, wages and incomes for all. Lower income taxes increase the incentive to for people to work leading to higher productivity and economic growth. High-income earners have a high marginal propensity to save. Therefore, the increased disposable income from a tax cut does not filter into other sections of the economy because it is saved not spent. Higher incomes may be used to accumulate wealth; this wealth accumulation leads to further capital gains and income from assets – leading to even higher levels of income and wealth inequality. The economist Thomas Piketty argues that, unchecked, inequality can grow because the wealthy can keep re-investing their dividends and profit. Higher GDP doesn’t address the fundamental inequality of capitalist society. Even if tax cuts did lead to higher economic growth, higher output does not necessarily lead to higher real incomes for all. Low-income workers may be left behind in certain types of economic growth. The UK recovery 2011-14 has been notable for low real income growth. Wrong target. If you want to reduce relative poverty, it makes sense to target income tax cuts and benefits at those who need it. Cutting taxes for the rich, in the hope some may trickle down to the poorest is a very inefficient way of working. Cutting taxes does not necessarily increase incentives to work (both the substitution and income effect are at work and may cancel each other out). It was hoped cutting income tax would encourage people to work overtime and work more hours. But in practice, this didn’t occur. The wealthy can invest the extra wealth in assets, such as housing. However, this pushes up house prices, increasing the cost of living for lower-income groups. Ronald Reagan was closely associated with the trickle-down effect in the 1980s. This is because, during his presidential term, he cut income tax for the high earners. He did not sell this policy on the grounds that ‘there will be a trickle-down effect.’ However, opponents often claimed that there was a limited trickle-down effect with median wages growing very slowly – compared to wages for the top 1% of income earners. 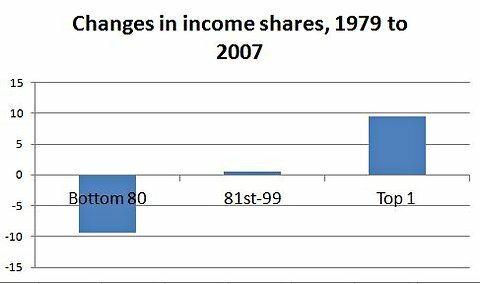 Top 1% gained an increased share of income, bottom 80% saw drop in income share. No trickle-down effect. Does higher company profit trickle down to the rest of society? Higher profit can trickle down to everyone in society. If profit is invested, new jobs are created. If profit is saved in bonds and shares, it can help finance personal pensions. Corporation tax means % is paid to the government for funding social spending. Bill Gates and other billionaire philanthropists have given much of his wealth away to charity. However, it depends on how profit is used. 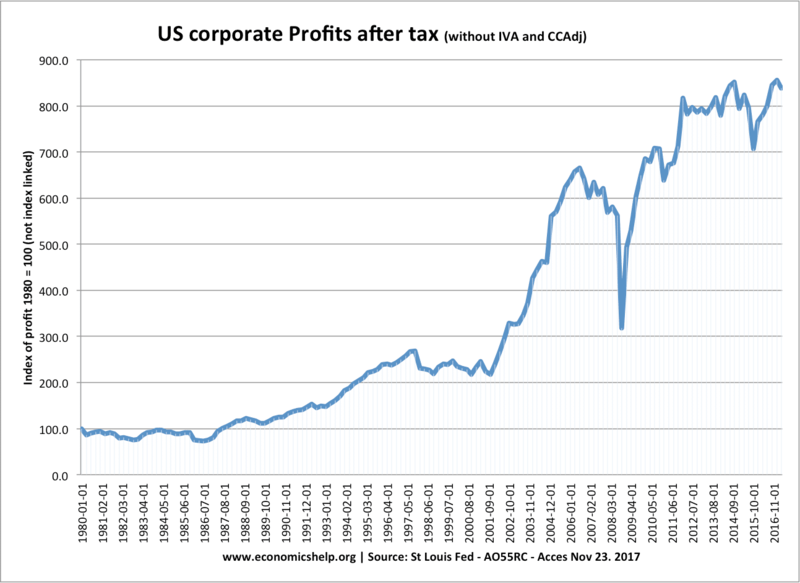 In the past decade, US corporation profit has increased significantly, but this has not trickled down into higher real median incomes. Cash reserves of many IT firms have risen significantly. 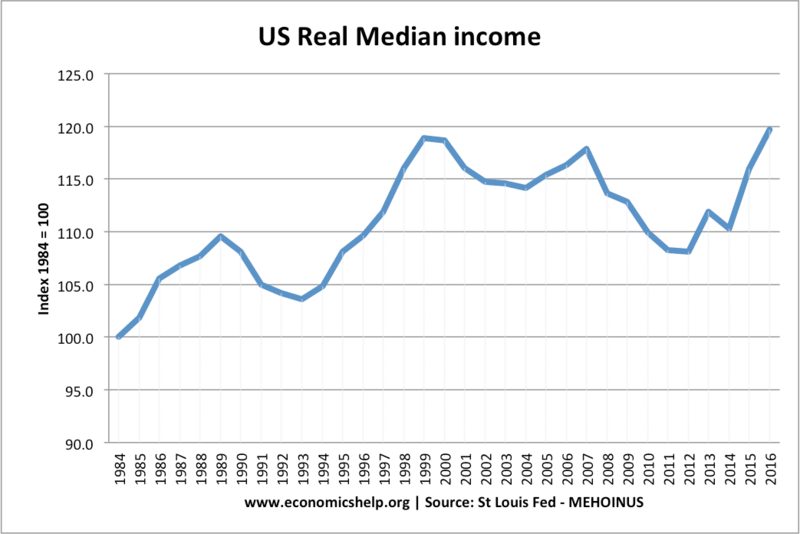 Real median incomes have been stagnant since 2000, suggesting average worker has not been benefitting from rising real GDP. This entry was posted in concepts, economics and tagged inequality. Bookmark the permalink. I can see cutting taxes if they are onerous and the capital investment in the country is lacking. I challenge a supply sider to explain how lowering taxes is going to create jobs when inventories are full and production capacity is idle. Why would they invest in new production equipment when what they already have is idle? Why would they add to their unsold inventory? Doesn’t make sense; doesn’t happen!